Our NFL Pick 'em pool format is arguably our most traditional football pool, with the option to pick against the spread or straight-up. Even though this format is basic, it can still be very difficult for someone running the football pool to keep up with gathering the picks and calculating standings manually. That is where we come in. What is an NFL Pick 'em Pool? New Option! Limit how many games must be picked each week. Picks can be made against the point spread or straight-up without it. If you go with the spreads, you can choose to use our point spreads or enter your own each week. For each correct pick during the regular season, members receive one point. Administrators may choose to assign their own point system for the post-season. View the Pick Distribution for all the Pick 'Em pools we host. Automated pick collections. 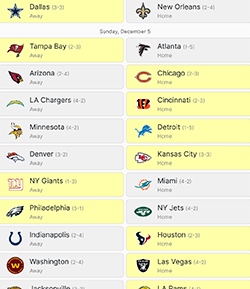 You no longer have your members send you their picks. 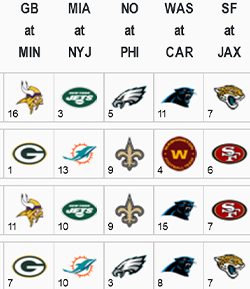 They login to the website directly to make their picks. Error-free pick sheet. We make it impossible for your members to make technical errors when submitting picks. Automatic updating. Pool standings are automatically updated in real-time. Add your company or organization logo to customize the look of your Pick 'em pool. For more information, see our Brand Your Pool page. Every NFL Pickem pool hosted at RunYourPool.com includes a free, private message board. Your pool's message board, accessible only to your pool members, is a great way to communicate with members. 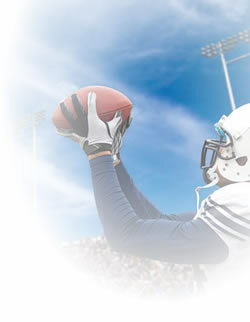 Start your NFL Pick 'em pool with us today. If you have any additional questions, please contact us via email at sales@runyourpool.com. We're happy to answer any questions you may have.